Email personalization is an email marketing process which uses personal information of subscribers to produce more targeted emails. It gives a personal treatment to the customer and increases email marketing metrics massively. When you want to squeeze juice from an orange, half of it can go to trash, because you didn’t try hard enough. Email personalization is an approach that contributes to squeezing your orange to the last drop. Rewards customer with a new experience. The subscriber’s personality is the main landmark for brands. Such attitude turns reading emails into an enjoyable and interesting process. Personalization removes any irritation from the users’ experience, providing them with rather positive emotions. Improves relationship. Personalization tends to humanize communication between sellers and buyers. Personalized emails are pretty much appreciated because each subscriber feels that brands examine and respond to their tastes and needs. Personalization increases shared value and both sides win. Total usage of email’s opportunities. These days people are being bombarded by tons of emails every day. When brand personalizes emails properly, email’s potential as a marketing media is totally squeezed. Therefore, fewer emails required to gain results. A reduction of informational noise in the inbox is a form of respect. Email marketing standard. As years go by, email personalization is becoming more precise and sophisticated thanks to triggered (event-based) emails. In fact, many instruments are available at the market that makes it easier to implement personalization in your email marketing campaigns. If you still don’t personalize your email campaigns but want to give it a try, check out the useful and handy tools for email personalization that SendPulse email service has on board. There are two layers of email personalization. Take a decision how deep you want to dive, depending on your business needs and possibilities. Check out two ways to personalize emails. Simple personalization basically displays information about the user in your email (such as name, country, birth date, etc.) Follow these instructions to personalize your email campaign with Sendpulse personalization. Smart personalization allows you to modify the contents of the email based on available user data. For example, you can send different product offers for both men and women in a single email campaign. Launch your creativity when you use smart personalization feature for more advanced email personalization because the sky’s the limit for smart personalization. Personalized experience increases sales thanks to a more targeted approach. 58% of all revenue is generated by targeted and segmented emails. Transaction rates increase six times due to personalized emails delivery. Only 39% of online sellers recommend subscribers what to buy via email. Personalized emails’ open rate was 18.8%, while without personalization, it was only 13.1% in 2016. Identify your task. First of all, you need to decide which way of personalization will be the most powerful to achieve your business goals. Create a plan and work it through step by step. Collect data. There is no chance of making a smart and complex personalized campaign if there’s no data about the subscribers. Try to collect as much data as possible: age, gender, birth date, address, phone number, purchase history and so on. SendPulse collects some of the data automatically for you, which makes your job a lot easier. Add more options in subscription forms. Just add desired questions in the subscribing form on your website or elsewhere. You can also inform your audience you want to make email offers and updates more targeted. These days, some subscribers want to provide their favorite brands with more data, to have personalized treatment they so adore. Segment your email lists. SendPulse gives tools for segmentation of email lists, so you would be able to create different campaigns for certain groups, based on the data you have at hand. Think through the best ways to segment your audience and launch the campaigns to see how efficient that is. Send behavior-triggered emails. You can get more advanced and set up a triggered email campaign, which sends subscribers different emails based on actions they complete on the website. This may require some technical skills. 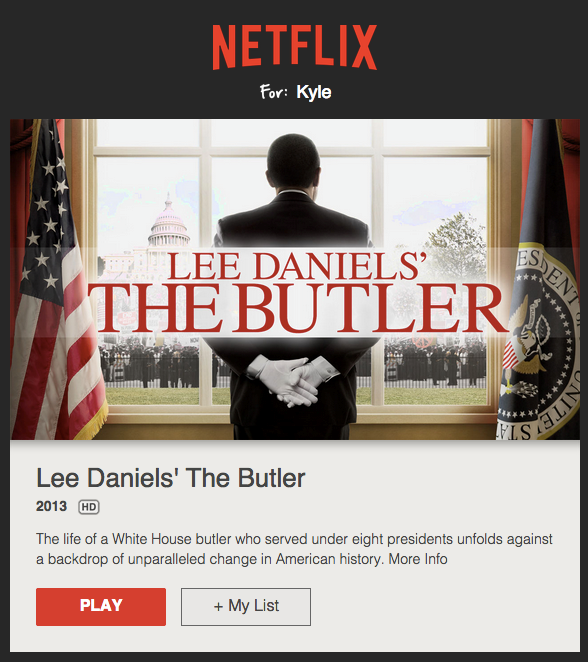 Having an enormous database, Netflix regularly sends emails with recommendations. They always make their subscriber feel how valuable their service is. 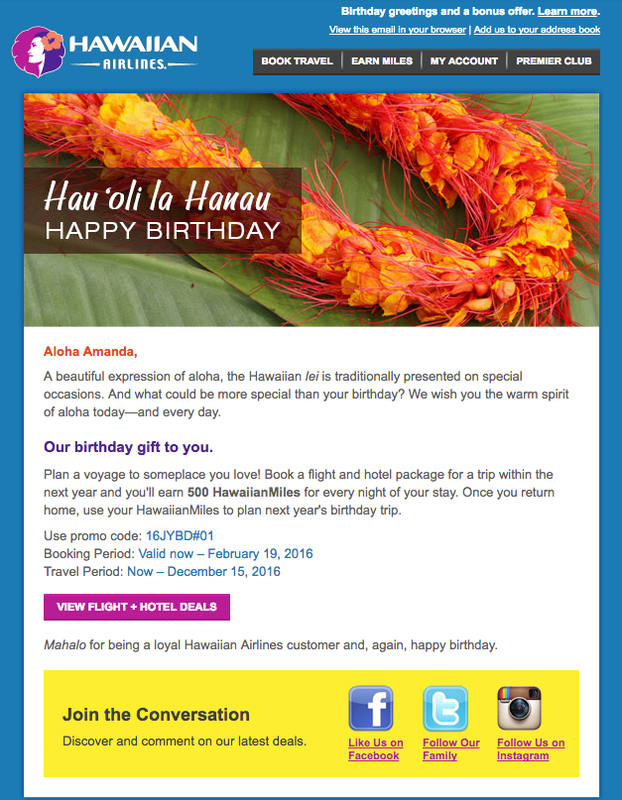 Hawaiian Airlines finds the best time to come up with such a proposal. Properly created birthday email it’s extremely powerful personalized email. Also searched with "Email personalization"
Rate this article about "Email personalization"
If you are interested in "Personalization" you might be interested in our bulk email service.